The beautiful scenic village of Cassis, France in Europe is situated along the Mediterranean Sea coastline of the Cote Bleue. 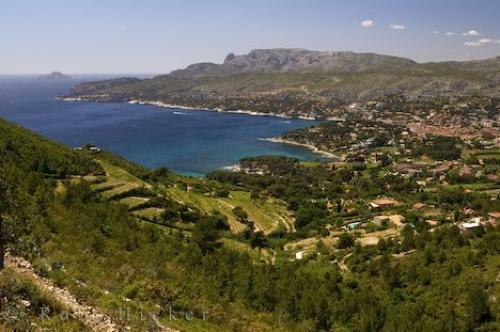 At a viewpoint from the Route des Cretes you get an excellent look at the coastline of the Cote Bleue and the charming port of the village of Cassis in France, Europe. The coastline of Cassis, France is host to beautiful beaches, numerous creeks and lush green hillsides which become a popular tourist destination in the summer months.Village of Cassis seen from Route des Cretes, Bouches du Rhone, Cote Bleue (Blue Coast), Mediterranean, Provence, France, Europe. Photo of the coastline that extends along the village of Cassis in the Provence, France.